Manuel Zelaya was President of Honduras from January 27, 2006 until June 28, 2009 when he was arrested by the military and removed from power. The coup d’etat was publicly condemned but quietly backed by the Obama administration. The democratically elected government of President Zelaya, an ally of President Chavez of Venezuela, was replaced with a regime supportive of Washington’s anti-Chavez military policies. Manuel Zelaya appears in the photo above. Honduras was planning to hold a June 28 poll on whether or not a referendum for forming a constituent assembly to rewrite the constitution should be on the November ballot. Many among the poor correctly viewed the current constitution as favoring corporations and wealthy landowners. As a result of the constitutional preference for the rich and powerful, Honduras has one of the largest wealth gaps between the rich and poor in Latin America. 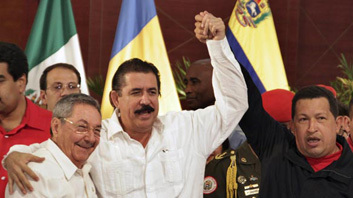 Washington and the Honduran elite were also angered that President Zelaya signed an agreement to join the Bolivarian Alternative for the Americas (ALBA). ALBA is a regional trade agreement that provides an alternative to the free trade agreements such as CAFTA that have been pushed by Washington, yet are opposed by many popular movements through the Americas. Zelaya’s proposal to transform Soto Cano Air Base, historically important to the U.S. military, into a much-needed civilian airport was unpopular in Washington, as was his lack of support for the privatization of the telecommunications industry. Zelaya is the eldest son of a wealthy businessman, and was involved in his family’s logging and timber businesses before entering politics. He was elected as a conservative but he shifted to the left during his presidency, which was unacceptable to the United States and the elites in Honduras. He now lives in exile in the Dominican Republic. American backed coups in Latin America are not new. For decades, the United States, along with its corporate partners, has tried to prevent socialism from taking root in the Southern region. To that end, it has instigated many coups against progressive, democratically elected leaders, and installed various right wing, corporate friendly dictators in their place. The conditions in Honduras happened to be conducive to another U.S. backed coup. In recent years, the United States, and its client organizations such as the World Bank and the International Monetary Fund, have been losing their economic power over Latin America. Latin countries have been banding together to support each other’s socialist democratic governments because they better serve the needs of the people in the region. More and more Latin American countries are deciding they know best what is right for their citizens—and it’s not U.S. style capitalism. The coup in Honduras was a shot across the bow from the government of the United States because it is not happy with the direction Latin America is heading, which is toward economic self-sufficiency and independence. Right after the coup, the United States backed government of Honduras issued a false statement that the United Nations deemed the takeover constitutional. This false statement was widely reported by the U.S. media. On October 14, 2009, the spokesperson for the Secretary General of the United Nations Ban Ki-moon clarified that it has always considered the forced removal of Zelaya an illegal “coup d’etat.” He reminded that the UN General Assembly Resolution 63/301 adopted on 1 July 2009 “condemns the coup d’etat in the Republic of Honduras that has interrupted the democratic and constitutional order and the legitimate exercise of power in Honduras.” Ignoring the UN resolution, the Wall Street Journal falsely claimed that the takeover in Honduras was legal. An extended defense of the takeover by the newly installed president of Honduras, Roberto Michelleti, appeared in the Wall Street Journal on July 27, 2009. To its credit, the Los Angeles Times condemned the coup and the Obama administration’s participation in it in an editorial dated August 31, 2009. When Honduran soldiers entered democratically elected President Manuel Zelaya’s bedroom and packed him off in his pajamas at gunpoint to exile this summer, the politicians and industrialists who backed the ouster had confidence that President Obama wouldn’t touch them. Even though the United States maintains 600 troops in Honduras, they thought they could pull off the first successful military coup in Latin America since the end of the Cold War. So far, they’re right: The Honduran junta’s intransigence in negotiations to restore democracy has been rewarded with U.S. complacency, setting an extremely dangerous precedent for other areas of the world. Unexpectedly, in the age of Obama, democracy is in retreat. The United States half-heartedly brokered a “negotiation” with Zelaya and the new regime through U.S. friendly Costa Rica. Zelaya returned to Honduras briefly but his return was not supported by the U.S State Department. The end result was that the coup was successful. On the one year anniversary of the coup, Jeremy Kryt wrote an extensive update on the coup in Honduras at Huffington Post. Unfortunately, conditions in Honduras have deteriorated since the ouster of Zelaya, and many of his progressive reforms that helped the majority of the people have been undone. The United States continues to back and provide aid to the new government. Where’s the positive progressive news in this story? Teachers, up against a proposed General Education Law that would privatize education, are at the center of mounting turmoil. They went on strike early in August, demanding the government pay back $242 million plundered from the teachers’ pension fund after the coup, pay into the pension fund more than $200 million unpaid since 2007, and reverse the firings of workers at the National Autonomous University. On August 20, police attacked 25,000 teachers marching in Tegucigalpa, wounding several. 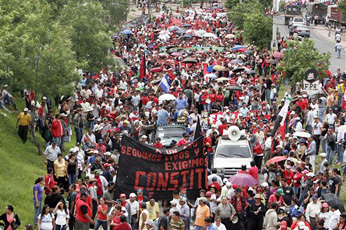 Some 30,000 demonstrated on August 23. “We don’t want public education to die,” Edgardo Casana, president of the COPRUMH teachers’ union, told reporters. . . . In a dramatic display of worker solidarity, “hundreds of thousands” of Hondurans mobilized by the National Front of Popular Resistance (FNRP) and the CUTH labor Federation marched on August 18 in support of the teachers. They demanded also a minimum wage increase; rejection of a proposed “public-private investment law,” seen as a vehicle for privatization; and action against a pending “law on temporary employment” that assails social security. The continued resistance of the people of Honduras is inspiring. Their bravery and resolve shines a bright light on the illegitimacy of the neoliberal economic model, the violence of imperial globalization, and the heartless campaign by financial capital to gain power over third world lands and resources. It’s a new day in Latin America and the collective resistance of Latin American peoples could very well succeed.